Apple is poised to become the biggest company in the world by ‘market capitalisation’. It maybe briefly inched ahead of EXXON yesterday in chaotic market trading, but it will very surely be well ahead of the pack by the end of the year. Apple’s sales and profits are rocketing and the value of the company is still being significantly underestimated by the markets. 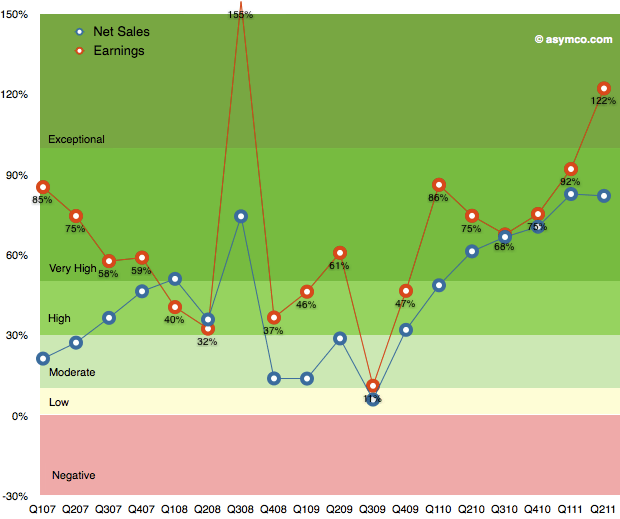 For fuller discussion of the chart see Asymco’s note on Apple’s growth scorecard for second quarter 2011. In Asymco’s deadpan style these sales and profit growth stats are dubbed merely”exceptional” or “very good”. But Asymco is being too phlegmatically Finnish, it is frankly unprecedented for a company with annual sales of approaching $100 Billion to be growing year on year at 82% (and in the preceding quarters 83%, 70%, 67%, 61%, 49%, 32%, 6%). You have to go back to Q3 2009 to find the merely respectable figure of 6% annual growth! The crazy thing is that there are some very strong planks in Apple’s growth strategy that we still cannot infer from reported figures. Only Apple knows, or can guess, how strong a part of the growth story will come in the next decade from the sale of music, film, books, and apps all coursing through iTunes and all generating a 30% turn for Apple. This IP-derived cash will become an important part of Apple’s revenue streams and even more of its profits, because the marginal cost of selling more digital media through iTunes is very low. We dont know much about Apple’s revenue from apps in iTunes, but we do know, from a press release, that Apple had cummulatively paid out over $2.5 Billion to app developers by July 2011, which means that Apple has retained $1.1 Billion from its share of sales of apps through iTunes (over the 4 years that apps have been for sale in iTunes). At the iPad 2 launch event in January Apple had announced 2$ Billion in payments to app developers, so it is probable that Apple sales from apps will comfortably exceed 1$ Billion in 2011. Buried within these gross figures, that are reported in bald outline, there will be an amazing amount of detail that is available to Apple only. Apple now has a good deal of insight on the relative buying patterns of owners of iPhones and iPads (now 150 million and 30 million owners in each case). Apple has a lot of information on individuals buying habits for music, film, and for apps, for games, productivity tools, ebooks and magazines and newspapers. Very little of this information is aggregated or understood outside the confines of Cupertino. It would be very interesting to know what the average iPad owner spends on media in the first quarter or the first year of ‘ownership’, on games, music, ebooks and periodical subscriptions. If the ‘average’ iPad owner spends $6 per annum on magazine subscriptions through iTunes there is already an annualised market for nearly $200 million in magazine subs. That figure may be too high at this stage when there are so many ‘experimental’ magazine apps out there doing their publishers experiments. But it is not outlandish to suppose that periodical subscriptions spending could soon head towards $10 or $20 per owner, which will mean that the market will soon be measured in billions. It would be informative/encouraging to know whether expenditure on various classes of media tends to increase or flatten out? There is a widespread belief that app purchases tend to focus around the very low prices on the Apple pricing matrix: 99c or $1.99. That stands to reason, but many publishers and developers would like to have more information, more guidance on pricing at higher levels for more sophisticated offerings. I suspect, and we have smidgins of data that bear this out, that iTunes is now selling relatively big ticket items well (by ‘big ticket’ I mean items priced at $15 or over, even $50 and over) Apple does not currently have a way of guiding developers and publishers on these issues: except through reporting sales on specific apps — which Apple does well, promptly and fairly, in my opinion. I suspect that the information that the market-wide information Apple now has on some of these issues is both quite surprising and also of minimal use to Apple’s competitors. So I expect that Apple will find ways of conveying more information that will help to guide the deliberations of its developers and publishers. (1) Renewals are good. We have limited data (less than three months) but there are indications that subscriber renewals through iTunes will be over 75%, possibly over 90%. Month by month. If annual renewals are also good, Apple’s and the publishers revenues from digital magazines enter a virtuous spiral. (2) Any special interest consumer monthly magazine with a paid annual circulation over 10,000 print subscribers will make good money from deploying a branded app in iTunes. The revenues from iTunes, even after Apple’s commission, taxes, and Exact Editions development charges, will significantly exceed the costs (there must be some exceptions to this rule of thumb, but we have not seen them yet). A magazine that has 10,000 subscribers in print will find 1,000+ subscribers in the 200 million consumers that have iTunes accounts. Next year that proportion will be higher, when there are 250 million iPads…..
(3) The gap between appreciation of magazines on the iPad (“I love my magazine”) and appreciation on the iPhone is widening (“the page IS small”). Most iOS magazine apps are being bought by iPad owners. The new iPad 2 is also clearly better than its predecessor for magazines. We think that the iPad 3 may mark another step change, especially for highly visual magazines. (4) A significant proportion of users who subscribe to a magazine in iTunes will choose the expensive option of a 12 month sub, rather than the easy option of a 30 day sub. Though all our publishers offer discounts for annual subs when they price their subscriptions for iTunes, in nearly all cases the reward for the 12 month sub is small — 10/15%. So we have been surprised to see 20%, 25% even 30% of subscribers opting for the bigger ticket (it varies with different magazines). Surely the adoption rate will be even higher when magazine publishers decide to start experimenting with promotional annual subscriptions in iTunes. This is excellent news for publishers who wish to maximise subscription revenues on the digital side, it is very good news for Apple also, though it is going to be another 9 months before we start to find out how good the annual renewal rate in iTunes is!